...and then spread out and kill on floor 1 as suggested. At each level, it has to roll low enough that not much leaks from the open grated windows across most of the stairwell's outer wall. ...and after the main floor, some fog would have to creep out into the street, and some back into the basement, if anyone there was to smell it, panic, and run to the upper levels, as some report. Some must have sunk here eventually for Swedish TV4's reporter to smell it strongly days later. Apparently no victims were found down here, but a few are nearby on the street just outside. But the basement is not shown in any night-time images, to prove it was empty or otherwise. M5 on the stretcher - this can clearly suggest he and the very dusty M4 next to him were brought here, from 2 different places. M4 does seem to have a different story from the rest here, but M5 could belong, as the woman and girl outside seem to. Maybe he was put on a stretcher as if to evacuate him, but then they got side-tracked... it's actually hard to say. 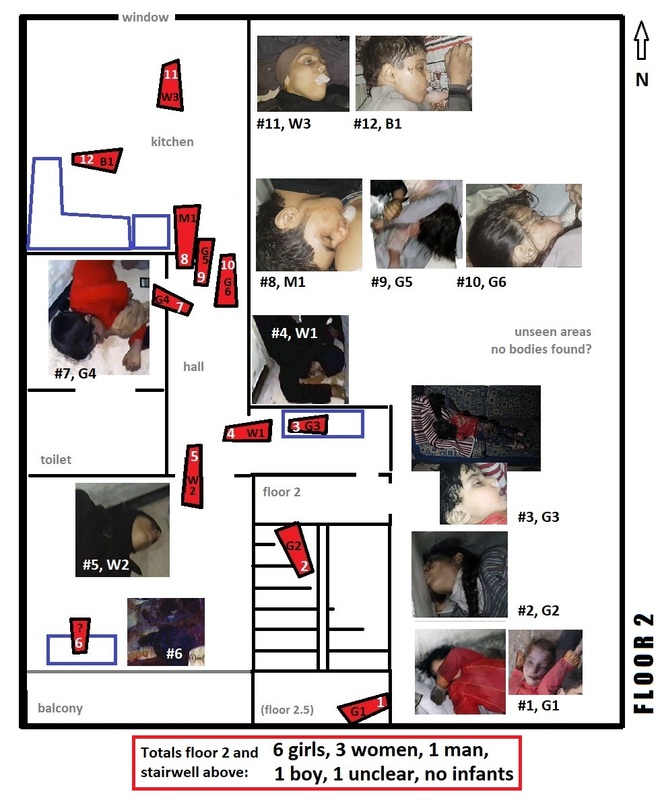 The VDC's martyrs database has 99 total Douma civilians killed on April 7, 85 from gas, just 14 from bombing. This number started smaller with hardly any identified, but grew and got more names over the following days. 49 of the 85 remain unidentified, all listed as men (which is also the default - it can mean blank/no entry). All 14 bombing deaths are also unidentified, listed as men. That's an unusual level of vagueness across two classes of victims. In fact there was at first one identified entry amon the first 50 CW deaths (a man by name as well, first entry), and exactly 35 with names and genders were added seemingly all at once in a later batch. 9 listed as men, 16 as women, 8 as girls, 2 as boys. 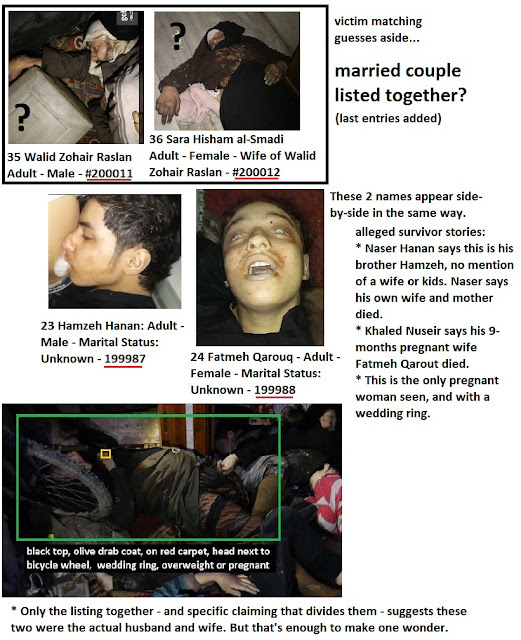 From those shown on video, I have 5 men, 9 women, 10 girls, 6 boys, one unclear (prob. woman - dressed in black) and 4 infants, 1 of which is clearly a girl (so 11 girls, 3 unclear infants). 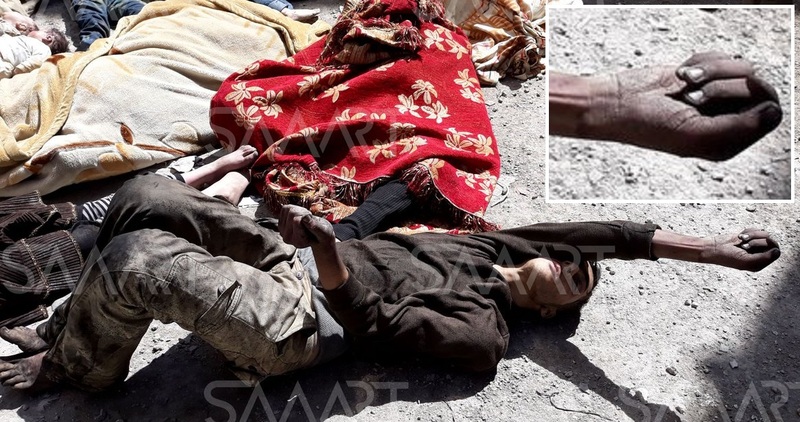 A recently noticed SMARRT news photo found by Qoppa 999 suggests this man (Victim #20 or M2) may have spent some time in shackles before he was gassed with these others in Douma. Now who would gas whose prisoners just as Islamist forces were preparing the flee an area? I've been looking through the videos with the camo-wearing father and seen the argument JaI would never do anything to "their own families". Are there any signs they are JaI relatives? Do we know anything about the local tunnel network and why militant families wouldn't be sheltering from airstrikes in those tunnels instead? No-one seems worried about handling the bodies- they have no worries about nerve agents? Chlorine 'mixture' has historically ended up as sarin and there is the cylinder with one end blackened: could this be the 'black sarin' or burned? when they say "our family" it underlines how it's probably not. The records so far suggest the people were not identified at the time, only slowly and partly identified now. No gloves on that guy carrying the girl, and that's just one example. Correct there. 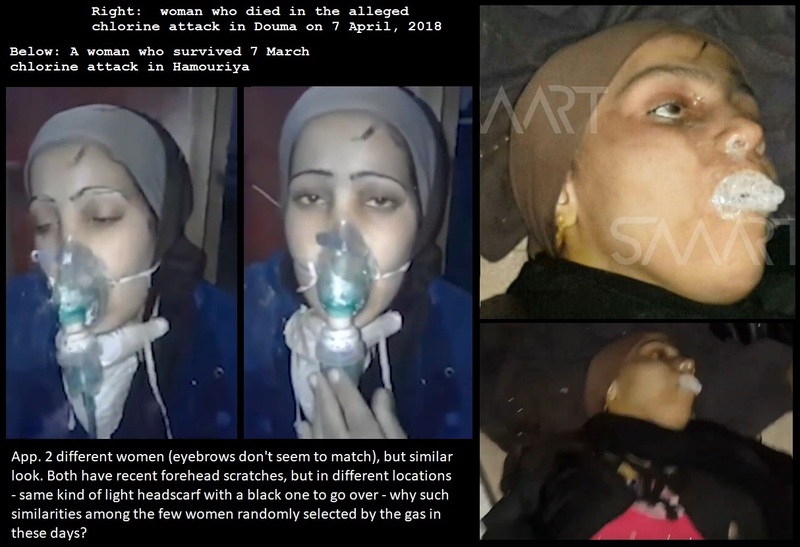 The black sarin thing, good q. It looked more like smoke residue, and the white dust, in an order I'd need to consider more, and some light rain since then. The blackish stuff lined to some sarin events is kind of oily, and this stuff didn't look that way so far. But I'll be reviewing things. The US/France/UK revealed intel seems to point to another unseen M4000-esque nerve agent 'barrel bomb' no-one seems to be able to find. Perhaps the M is for Morad. "One said the gas smelt like car batteries." - I thought this was interesting. I can't see the OPCW finding anything that goes against a nerve agent (as West has already bombed) but if the story is true about the fire what else could this be.. an electrical fire? 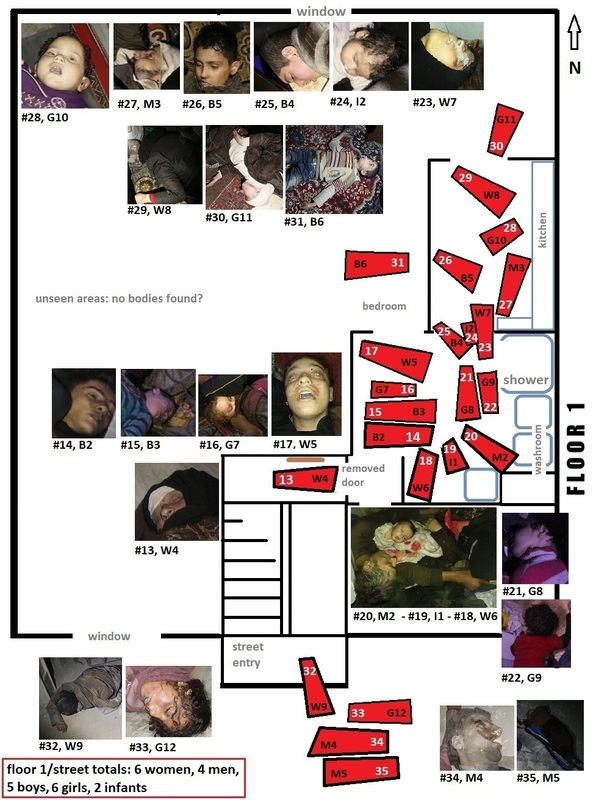 The story is that these victims didn't hear, see or smell something that made them drop dead in a few steps but made the people in the building next door just faint briefly and foam at the mouth.. even though they walked directly towards and into the gas. And lay down in it for a while. I assume 4th floor is US and means the very top floor (next to, I also assume, the bed cylinder). They went to a medical point "at the end of the tunnel" (BBC) etc. People didn't notice the helicopter/'barrels' and were even stood outside during the heavy bombing? Why were their shoes in the basement if they were stood in the street? Follow up question for Nasr Hanan: if everyone in the house died how did he watch his brother in the kitchen? Didn't he try and save his family if he was inside the house instead of leaving them foaming on the floor? If you want to match the cylinder position in the original video it would have to match the video frame tweeted and deleted by Eliot Higgins by the way, later videos the cylinder is in a different place and the edge of the hole collapsed. If it 'perfectly matches' later videos they are not looking at the cylinder as the cylinder was originally at a different angle to the hole. People seem to be making things up again. Could be based on Abdullah Abu Homam "their clothes were still wet so we believe they tried to rinse themselves in vain".. so a guess? 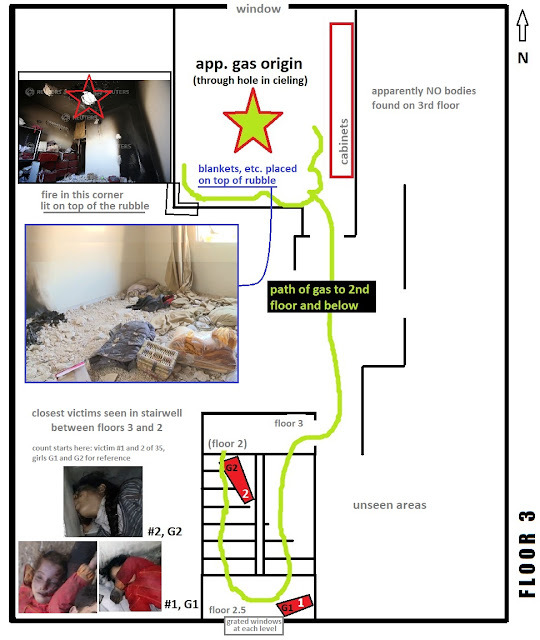 BBC/CNN story above: given the location of the bed cylinder, either the gas poured in from the street via neighbouring house from the balcony cylinder (a very short time after the hissing sound, 2 volunteers came back "seconds" later to say it was gas) or there is a third cylinder we haven't seen (not mentioned by OPCW). Gtrans gives Tuqaa as the pronunciation. Meaning: pious. Perhaps same video, another scene: guy touches girl 8 and says this is Rahab. There's no Rahab listed, but a Rahaf Bakriyeh even listed as girl. Probably refers to the same That's 4 tentative IDs, now added to the list. Also Syrian gov did an exchange for prisoners. How does that work at the same time as random chlorinerve gas bombing? Trying to accidentally kill all the prisoners they want released? New report (paywalled after 1 view) https://www.ft.com/content/651d4d56-4e15-11e8-a7a9-37318e776bab says the OPCW are going to try and exhume the victims. No convincing survivors to take samples from? Have the 500 gone missing? Ahmet Uzumcu, head of the OPCW said its FFM had already gathered over 100 "environmental samples"
"From the bodies already buried we are looking for ways to exhume if possible and take some biomedical samples," "first time we have exhumed bodies"
- so from this it must mean that no-one else has died since or gone to Turkey for treatment and subsequently died. And that excuses are already being prepared for finding nothing. From SNHR: White Helmet Ahmad al Islam "I saw three dead bodies laid on the ground in front of a bunker. There was no blood on any of them." The 3 bodies = deaths in the story above from neighbouring basement? He then goes on to tell a story of going "down the bunker" and seeing the victims in the other house so it might just be not true unless he has mixed down with up. But could explain the origin of the 3. 3 bodies in front of an underground shelter/bunker sounds like someone who didn't actually go into the video building, but saw the video with the misleading cut that makes it seem like people are in the basement. There are 3 bodies in front - no, 4, but maybe is one easy to miss in the most-seen video? If so, that's my guess.